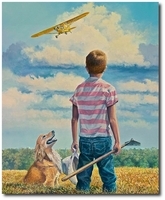 Rick Herter is an artist with a pilot's soul. Born in southwestern Michigan, Rick grew up with a sketch pad in hand and took his first airplane ride on his thirteenth birthday. That first air adventure with a former W.W.II bomber pilot at the controls would make a lasting impression on the young artist. After graduating from Spring Arbor University with a BA in art in 1984, he took his artistic skills and began working in the commercial art and illustration arena. Herter's interest in aviation was never far away. Rick approached the air show director of an annual Michigan air show offering to create a commemorative air show poster. That first poster went on to win a national award and the following season, the artist was commissioned to create work for shows in Pittsburgh, Denver and Cleveland. In 1987 Rick was invited to become a participating artist in the elite Air Force Art Program. 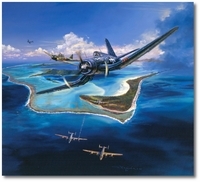 The AFAP, under the office of the Secretary of the Air Force, was created in the 1950's using the talents of select artists who volunteered their time to document Air Force activities and history worldwide. 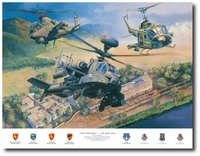 In 1990 the artist was awarded the prestigious American Spirit Award by Air Force Recruiting. The award is Air Force Recruiting Service‘s highest form of civilian recognition. Through the late 80's and early 90's, Herter's client list began to grow. The artist's work has hung in numerous private and public collections worldwide. Some of those collections include the Smithsonian Air and Space Museum, The Air Force Academy, the U.S. Navy and the Pentagon. His list of Corporate clients reads like a who's who of the aerospace industry; The Boeing Co., Rolls Royce, G.E. Aerospace, Gulfstream, Delta Air Lines and UPS are just a few of his corporate collectors. Besides the U.S. Defense Department, his work has been commissioned for the armed forces of Israel, the Netherlands, Singapore, Japan, the United Kingdom, Kuwait and Greece. A very unique historical project of Herters' was the recent completion of the world's largest indoor, hand-painted mural. The mural located at the AIR ZOO in Kalamazoo, Michigan, measures 32' high by 900' long and tells the story of flight. The mural is 29,000 square feet and according to the folks at the Guinness Book will put the artist in their record book. The artist's travels have taken him around the world from the Orient and Europe to nations in the Middle East. 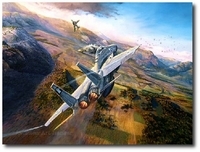 In the spring of 2003 the artist logged combat flight time by flying missions with Air Force units during Operation Iraqi Freedom. His Flight experiences have included classic aircraft like the P-51 Mustang to modern day fighters including the F-14 Tomcat, F-15 Eagle and F-16 Fighting Falcon. Herter has flown on missions overseas in B-52's and soared over the Alps with the German Air Force in F-4 Phantoms. He has flown low level in Army attack helicopters and accompanied the first combat units into Haiti for Operation Restore Democracy. Rick has flown on numerous combat training missions with Air Force and Naval Fighter units worldwide. Herter is an active member of his community and regularly speaks to church, school and service organizations. "Animas Crossing: Making Steam for Silverton"
"Dawn Operations, Abraham Lincoln Style"
"Ground Zero, Eagles on Station"
"In the Courtyard of God"
"Into the Wind, The Enterprise on Yankee Station"